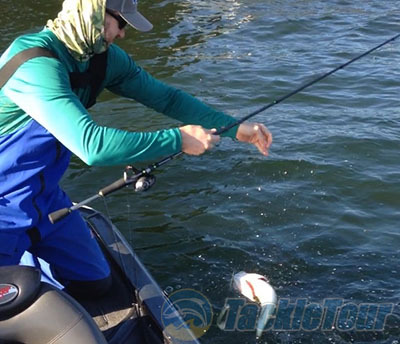 Introduction: Anglers hear the words �lightweight� and �sensitive� all the time. They are two of the most used words in the world of fishing and rod marketing, but unfortunately the respective product sometimes falls short. I've become so conditioned to reading or hearing this that it now means very little to me when a company or pro angler announces it in their latest advertising strategy. The Okuma Helios HS-CM-701M hits the water for testing. When Okuma came out with their Helios lineup of mini-guide rods, they were touted as being the lightest Okuma has ever offered. I jokingly thought �Okay, maybe their lightest bass rod weighs 4.5 ounces and now they will offer one at 4.4 ounces.� This idea quickly evacuated my mind when I first held a few of these sticks and saw their published weights�these are indeed light! After a quick transaction with TackleWarehouse.com we had an Okuma Helios HS-CM-701M in the TT lab a few days later to begin our testing cycle. Lure Wt. 1/4 - 5/8 oz. The rod's ratings are clearly indicated between the split EVA grips. Quality/Construction: This model has the distinction of being the lightest Helios rod. Checking in at a surprising 3.4 ounces on our lab scale, the 701M practically vanishes in hand. Couple this rod with an ultra-lightweight baitcaster such as a Steez, Core 50, or (can't forget the obvious) Helios Air, and the setup might just float away on its own! This rod is quite a looker�in a stealthy way! It was easy to see that our test rod was put together with careful hands. The 40-Ton matte-charcoal blank is adorned with perfectly-aligned ALPS mini guides that were mounted with no sloppy thread wraps or unsightly epoxy blops to be seen. The split EVA grips are gussied up with lime green trim rings at each end, while a sporty PacBay Minima reel seat with a ton of blank-exposure area finishes off the handle region. Performance: The Helios was put through a barrage of on-the-water testing from Lake Okeechobee to Lake Lanier. Various reels including a Daiwa Steez, Quantum Catalyst, and 13 Fishing Concept A and C reels found temporary homes on this stick. Twelve and fourteen-pound mono, as well as twenty-pound braid were the lines of choice during the test period. Okuma Pro Anthony Hunt joined me for some testing on Lake Okeechobee. Casting: Though a seven-foot rod is a smidge on the short side compared to what I usually prefer in a casting rod, this thing is a hoot to fish. Not only is it super lightweight, but it has a fast action that feels lively. 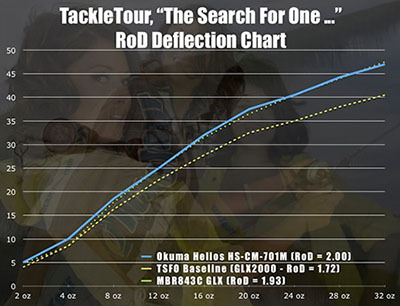 When you work down to our deflection chart, you'll see that the Helios 701M follows very closely with the track of the G. Loomis MBR843C�one of the most legendary rods around. The 701M loads easily and allows for excellent accuracy. Showing off the fast taper of the 40-Ton blank. I threw a huge variety of baits from weightless flukes to soft swimbaits. In fact, on a recent trip to Georgia's Lake Lanier I spent a lot of time throwing a weighted paddle tail (which probably weighed about an ounce) and thought it felt acceptable, however I didn't push it any heavier than that. When using bottom-contact baits I preferred to stay right in the rod's rated lure range since that's where the best performance is for dragging and hopping jigs and plastics. Video screenshot of me losing a 4+ pound spotted bass right at boatside...OUCH!!! Like other mini-guide rods I've used, I didn't have any trouble casting while using a braid-to-leader albright knot. However, pitching can cause this knot to hang or catch in the tiny inserts which can lead to a spool overrun and/or your lure not going anywhere. Up close and personal with the ALPS mini guides. Sensitivity: Constructed using a 40-Ton blank, the Helios provides feel that is above average. The material is crisp and relays vibrations and bottom contours directly through the gaping cutout in the PacBay Minima reel seat. Whether hopping a football jig or slow reeling a swimbait, I was always able to feel �connected� to my bait. Power: For a medium-power rod, the 701M delivers exactly the type of power I expected�not too much, and not too little. The backbone is up to the task of setting the hook at longer ranges and controlling a ticked-off fish, while the rest of the blank has enough forgiveness to instill confidence if you choose to fish lines in the lower range of the rod's rating.